Why do strains like Blue Dream and Harlequin have such different effects? In large part, it’s because they have very different THC-to-CBD ratios. THC and CBD are the two most abundant cannabinoids in most strains. THC is well known as the major psychoactive compound. CBD is best known for having a wide range of medical uses. While CBD lacks the psychoactive properties of THC, it does influence the effects of THC in the brain. This is why the THC:CBD ratio strongly influences a strain’s effects, and why that ratio is important when deciding which strain is right for you. Here’s the cool part: The THC:CBD ratio is largely determined by strain genetics. Each plant’s genetic code determines the way the plant produces the two compounds. It’s a fascinating process that many consumers aren’t aware of. THC and CBD are both made from another cannabinoid called cannabigerol (CBG). Within cannabis plants, each of these compounds is actually present in a slightly different, acidic form. The plants are really making either THCA or CBDA out of CBGA (Figure 1). It’s only after THCA and CBDA are decarboxylated by heat that we get significant levels of THC and CBD. The heat energy from your vaporizer, lighter, or oven causes a chemical reaction that turns THCA and CBDA into THC and CBD, respectively. THCA and CBDA don’t have the same effects as their “activated” (decarboxylated) counterparts. Remember that scene in Super Troopers where the guy eats a bag of cannabis flower and goes out of his mind? That wouldn’t really work, because flower contains mostly THCA, which isn’t psychoactive. You would have to heat the flower at the right temperature first, turning the THCA into THC, before eating it would get you high. A single CBGA molecule can turn into a single THCA or CBDA molecule, but not both. How does the plant decide which to make? That depends on the presence of an enzyme that comes in two flavors. Let’s call them Enzyme 1 (E1) and Enzyme 2 (E2). E1 takes CBGA and converts it into CBDA, while E2 converts CBGA into THCA (Figure 1). 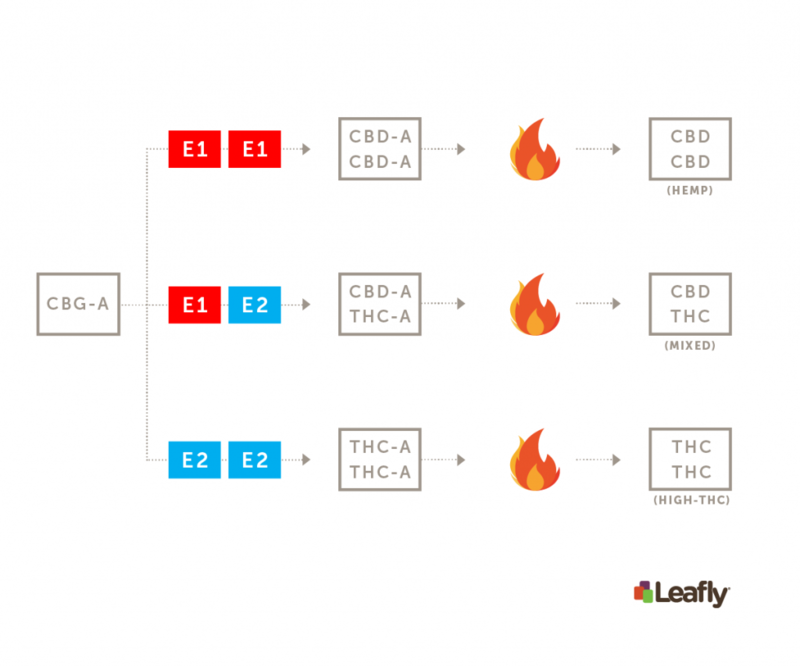 Some strains only have E1, some only have E2, and some have both. Like most plants and animals, cannabis plants inherit two copies of their genes. As it turns out, the E1 and E2 enzymes that turn CBGA into either CBDA or THCA are encoded by two different versions of the same gene (in reality things are a bit more complicated than this, but the end result is the same). Because each plant gets two copies of that gene, there are only three possibilities: A plant can have two copies of the gene that encodes the E1 enzyme, it can have one copy each of the genes that encode E1 and E2, or it can have two copies of the gene that encodes E2 (Figure 2). 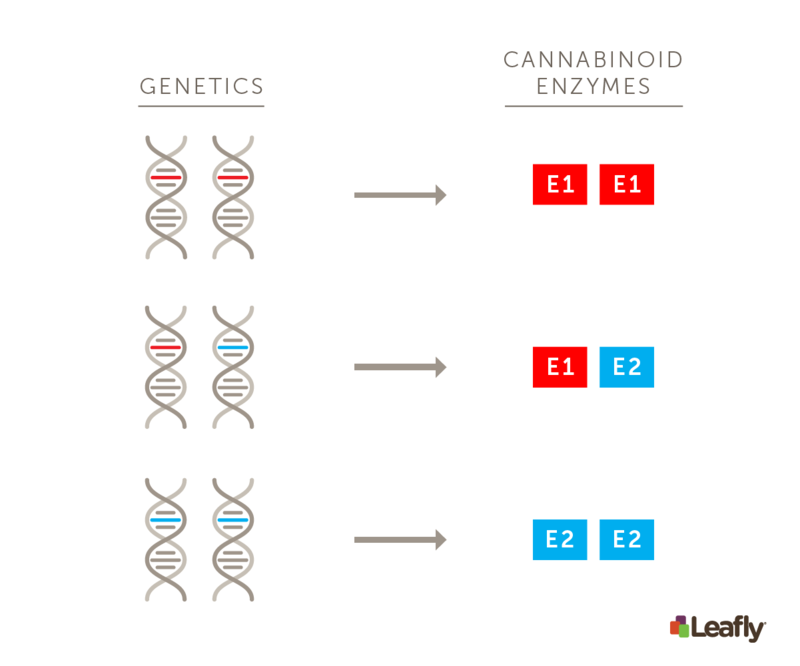 CBD-dominant strains (hemp): If a strain gets two copies of the gene that makes E1, only CBGA to CBDA is possible. These strains will have high levels of CBD and negligible levels of THC. Charlotte’s Web is the most famous strain in this category. Balanced strains: If a strain gets one copy each of the E1 and E2 genes, it will produce CBDA and THCA at somewhat similar levels. Let’s call these “balanced strains”—they produce both CBDA and THCA. Strains like Harlequin or Cannatonic are good examples. 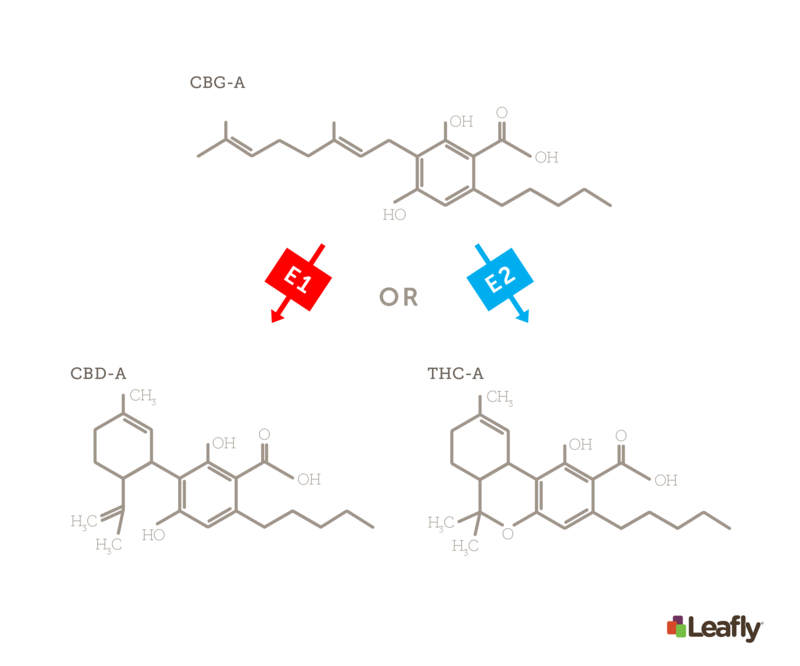 THC-dominant strains: If a strain inherits two copies of the E2 gene, only CBGA to THCA is possible. These strains make up most of what we see on dispensary shelves today. Blue Dream, GSC (f.k.a Girl Scout Cookies), and the bulk of commercial strains fall into this category. They have high THC levels and negligible CBD. Cannabis genetics limit THC and CBD production so that only these three broad categories of flower are possible. Hemp strains do not produce significant levels of THC, while most commercial strains fall into the THC-dominant category—they have THC but negligible levels of CBD. 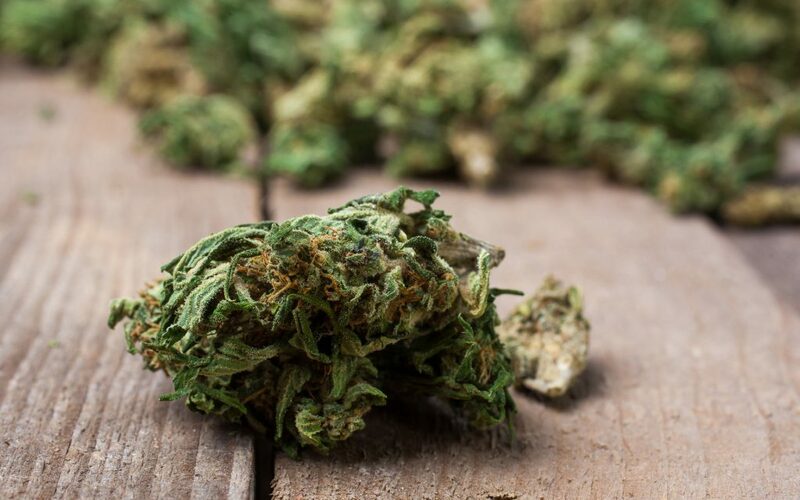 “Balanced strains” produce both THC and CBD, but generally not as much THC as THC-dominant strains or as much CBD as the more potent hemp strains. In the next article of this series, we will explore more precisely what the limits on THC and CBD levels are for each of these categories. Later on, we’ll consider some of the effects you may experience when consuming strains with different THC:CBD ratios. Fascinating! Great introduction to plant genetics. Genetic makeup plays an important role in how a Cannabis plant turns out, there are other factors too, but it starts with great genetics. Very interesting. How about enzymes for CBDV-A and THCV-A ? I DM’d you on Twitter, but just want to say this is an inaccurate representation of the underlying genetic structure of cannabinoid production. Take a look at the Weiblen et al. paper from 2015. There’s more that has come out since that one, but it’ll give you a better understanding of what’s going on. No one has define that CBD degraded to which chemical?? where as THC degraded to CBN. Is there anyone who can answer this question? The guy in Super Troopers also ate a bag of Mushrooms, hence the psychedelic effects. I wanted to buy into what you’re saying in this article, but you lost my trust right at the beginning with talk of decarboloxation. So, I’ll ask how do I get so incredibly high from eating hashish? Everything else was rather informative. Now, I do have more heartburn than I’d like, but I’m not sure if my colon is decarbing that hash. The heat applied to make hashish is the decarb mechanism. Can they mix say an Indica and a sativa together and create a mix for people with pain, anxiety and depression? 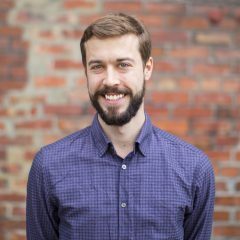 Interesting article and linked documentation, thanks. From the simple genetic explanation of the CBD:THC ratio root cause I would expect varieties with ONLY CBD and others with only THC.